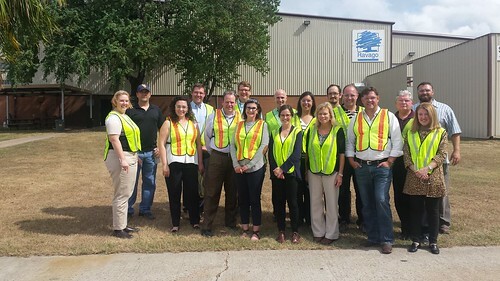 The Sustainability Consortium hosted the Plastics Supply Chain Field Tour in the Houston and Freeport, Texas, areas on October 20-21. With the help of our sponsors—The American Chemistry Council, Dow Chemical, and Chevron Phillips Chemical—TSC guided a group of about 20 participants through facilities involved in the manufacture and recovery of plastics, with an emphasis on plastic packaging. The tour started at a Dow facility, Pack Studios, in Freeport. The facility serves as a research and development center where packaging concepts are developed through collaborations among product designers, scientists and technicians, and product and equipment manufacturers. The facility addresses everything from experimenting with new chemistries and processes to focus-group testing of finished packaged products. Our group saw examples of equipment used for such processes as injection molding of plastics parts, applying adhesives to films, and converting mixed plastic resins to layered films. Then we reconvened for lunch and questions with Dow staff. From there, the tour moved to Accredo Packaging’s facility in Sugar Land. The facility is a production-scale center for flexible packaging converting that makes primary packaging for many product lines that were familiar to tour participants. After a presentation by Accredo’s staff and a Q & A session, participants were led in small groups on a tour of processes spanning from the blow film machine that converts resin to plastic film to the lithography equipment that renders brand designs on the finished packaging. After the tour, a delicious dinner with plenty of opportunity for discussion and networking capped the day. The second day of the tour focused on plastics end-of-life. The tour began at Waste Management’s material recovery facility outside of Houston, where we learned much about what can and cannot be recycled and the economics of sorting and recycling various materials. We learned that recovery facilities are not all configured the same way, which leads to great disparities in recycling efficiencies for various materials and, it appears, great confusion among home recyclers. After lunch and discussion, we finished the tour at Ravago’s plastics recycling center in Waller. Here participants were able to see how the loop can be closed on the plastics life cycle. The facility gathers up mostly post-industrial plastic waste in separate waste streams, depending on plastic type, and melts it back down to plastic resin pellets that serve as feedstocks for new plastic products. Though they strive to produce a high-quality product, the mixed nature of their inputs mean that they can’t produce pellets that are as high-quality as virgin plastic. This and the sheer volume of plastic that is simply never recycled both pose difficult challenges to closed-loop recycling for the plastics industry. The key objective of the program was to provide a learning and networking opportunity to sustainability professionals who have an interest in plastics. We were able to provide a bird’s eye view of a large part of the supply chain and demonstrate some of the challenges and opportunities present in converting plastic resins to products and products back to plastic resins. Participants left with a better appreciation of these challenges and opportunities and will hopefully continue to collaborate to find more sustainable approaches to using and recovering plastics.